-Very simple. Go from town to town upping your character's level and stats and when you think you're ready you head to Lot's Tower and take him and his 8 gaurdians out. Almost all controls are based on the touch screen, very little is based on the buttons of the DS. The world map is where you change what town you are at, Save, exit and select items in your player's hands. 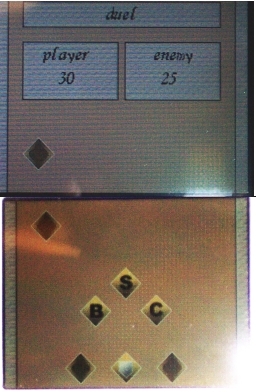 Use the Left, Right, Up or Down arrows to change towns (Note you can also use the A,B,X,Y buttons as well). If you want to save click on the disk icon and it'll bring you to a screen that'll display the current saves you have. To change what items your character is using in battle use the left and right arrows. Click on the up arrow to move into the town. 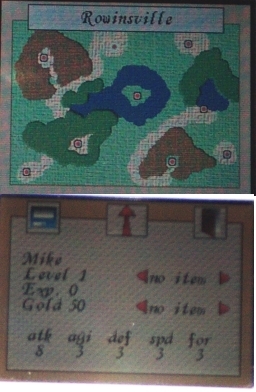 The town names along with the map are displayed on the top screen. There are three types of items: Damage, Shield and Health. Health replenishes X% of health, Damage does x% of undefended damage(based on strength and agility), Shield raises your defense x% temporarily during a battle (till the end of the battle). There are four strengths of each item. Click on it to purchase. In the tavern there are three people. A talker, they give you information. A giver, who will give you one item for free and a dueler. These dueler's will always contain one more attack slot than your character. After the dueler is defeated your character gains an extra attack slot. The arena has three contestants. Weak, Mid and Strong. Basically the weak is the easiest, mid and then Strong. When you tap on one of the labels it starts a duel. This is a fairly simple concept. You have x attack slots. With this attack slot you can do x different options in a round. B -> Back up and slash, S-> stand and slash, C -> charge attack, Shield -> Defend, Left Hand Item, Right Hand Item. On the top screen you'll see your opponents attack slots and depending on your speed and foresight you may/may not be able to see what moves they are going to commit to. If you have the opportunity to see what they are going to do you can choose the best form of attack (experiment or talk to locals to figure out two good hints on this). The damage is dealt per attack. If your player is faster than the enemy your attack damage(to them) will be inflicted first (one point at a time). This is important from the stand point of dying. If you're faster than your opponent and both of you deal a "death" blow the faster one will most likely win the duel(based on the health of the current situation). After defeating people in an Arena you will be awarded gold, experience and a stat boost. The stat boost is based on which person you're fighting (W,M,S) and which town you're in. Each town has different stat attributes to there fighters and therefore different stat boosts. Arena DS Neo Flash Compo 2005 Edition NEWEST!